With the creation of the Global 7000 comes many firsts for Bombardier business aircrafts. The brand new aircraft redefines the business of jet travel with its expansive four-zone cabin and a reserved crew area. 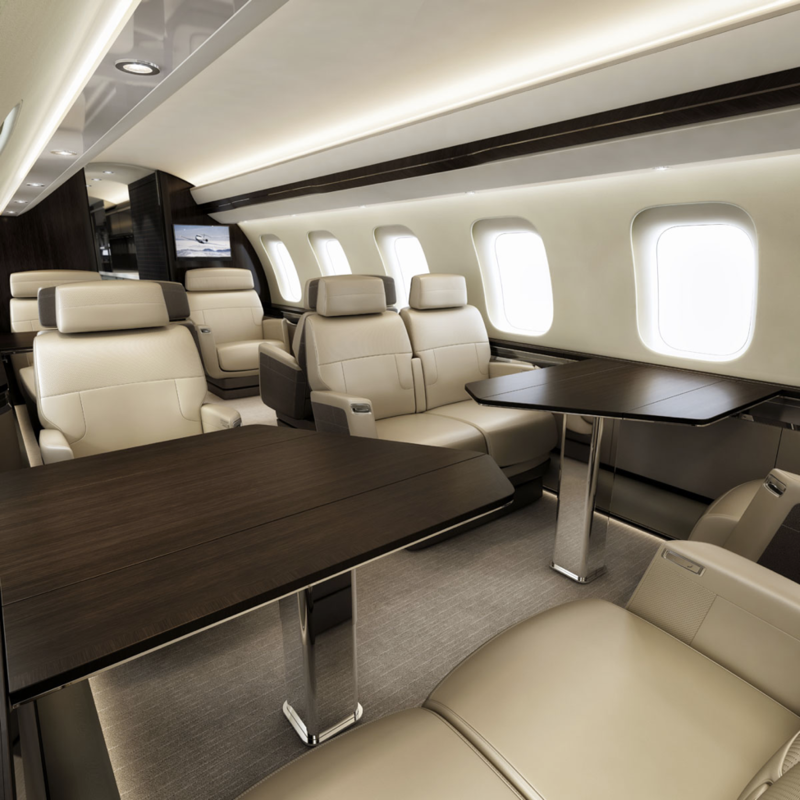 This sprawling jet can hold up to 17 passengers and is sure to meet your business goals. Successfully completing its first flight on November 4, 2016, the Global 7000 is scheduled to enter into service later in 2018. 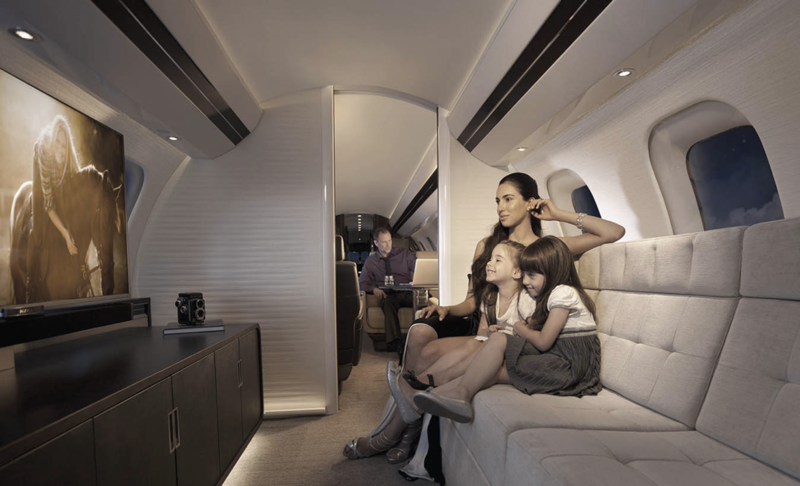 As the first purpose built, four-zone business aircraft, Bombardier allows customers to customize the arrangement of the cabin and living spaces based on their needs. In comparison to the Global 6000, the 7000 is longer, has a larger wingspan and a bigger cabin allowing for multiple living spaces. 28 extra-long windows that are 80% larger than the Global 5000 and 6000 provide an abundance of natural light to the cabin. Mechanical window shades are an added convenience for passengers. 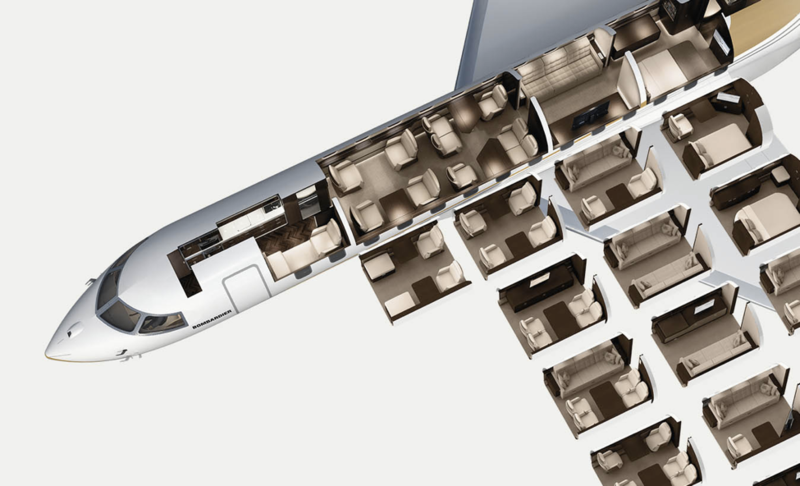 A 20% larger galley than the Global 6000 provides the crew with optimal storage and prep areas. Additionally, the two GE Passport engines that power the Global 7000 received U.S. FAA approval in April 2016. The Global 7000’s interior is spacious yet offers privacy when needed. Designed to be an extension of your office, the aircraft’s sophisticated style and limitless suite selections can help to boost business productivity. Included in various floorplans is a private conference suite that seats six with luxury designed recliners and height adjustable conference tables. Other options for business needs include conference grouping with double seats and single executive seats all with accompanying work tables. The Global 7000 also comes equipped with Ka-band, the fastest internet worldwide in aviation to optimize work time in-flight. Luxurious cabin options and a private master suite offer amazing comfort to help unwind. Within the master suite, passengers will find a double bed and television, while the adjoining en suite offers a true stand up shower. The entertainment suite includes a large screen television that can stream fast and reliable HD content and a large sofa, guaranteeing that passengers will feel right at home in the air. Additionally, an advanced air management system that delivers 100% fresh air helps quickly regulate the cabin’s temperature. Optimized cabin pressurization also provides a low altitude environment in the cabin to help passengers feel more energized and have less jet lag upon arrival. Offering a spacious 111-foot cockpit, the flight crew of the Global 7000 will be equipped with advanced avionics technology as well as superior aesthetics. Fly-by-wire technology offers ultimate precision and control throughout the flight. With the long-range capability of flying 7,400 nm, crew rest accommodations for the Global 7000 are an added convenience. A dedicated crew area maximizes comfort and efficiency during long flights. A brand new re-designed galley is the industry’s largest and most luxurious. Exceptional storage space, top of the line cooking amenities and prep areas make it easy for crew to cater to passengers. The galley has the ability to deliver an array of meal selections from around the world. 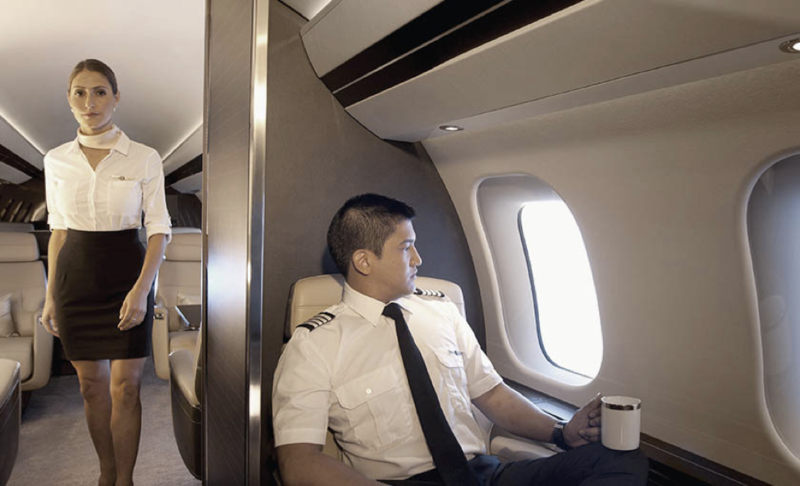 Although the Global 7000 jet was designed for business, passengers will find much more when they step on board. With countless layout possibilities, the Global 7000 can fit the needs and wants of those seeking a true business jet.